University Campus. 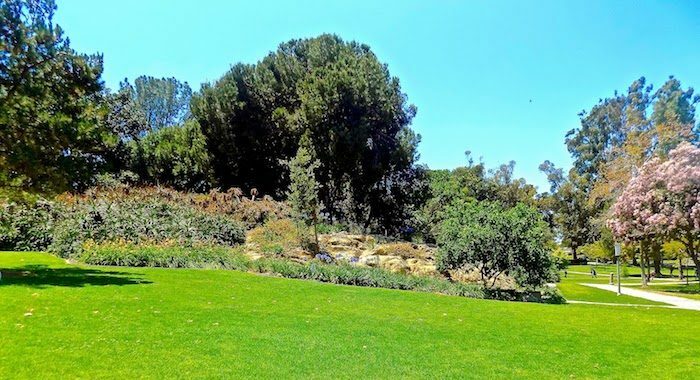 The highlight is Aldrich Park, hilly, grassy expanse featuring a botanical garden. About 1 mile of paths inside Inner Ring Rd. Then, make your way through Founders Court to the Athletic Fields and track at the northern part of the campus. On the north side of University Dr. (a wide road, not that pleasant for running), connect to the paved Mountains to the Sea Trail & Bikeway, along San Diego Creek. It’s 1 mile WEST along the path to Mason Park, and 1 mile EAST to the Newport Back Bay Loop. Mason Park. Just north of University Town Center, and 1 mile from Aldrich Park. 9 acre lake with ~1 mile trail, and 2.1 mile paved University Trail going east-west through the park. 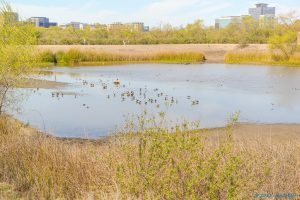 San Joaquin Marsh and Wildlife Sanctuary. 11 miles of nature trails. 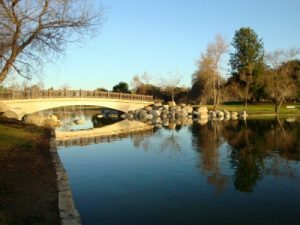 Best bet for runners is a 3 mile loop following Riparian View, Michelson Dr., Carlson Ave., & Campus Dr.
Newport Back Bay Loop. The eastern end of this popular 10.5 mile loop is 1 mile from campus. See our separate entry.